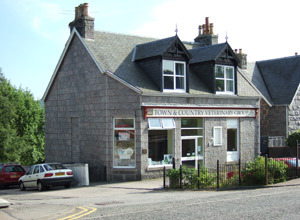 The Bieldside branch is located 1 mile west of Cults beside the main road to Banchory. There is a car park at the front to ensure ease of access. The reception area is fully stocked with a range of pet foods and pet accessories. Anything we don’t have can be ordered with next day delivery. Our receptionists will always ensure that both you and your pet are given a warm welcome and made to feel at ease. Our main veterinary surgeon is Julia Mitchell. Meet the team.